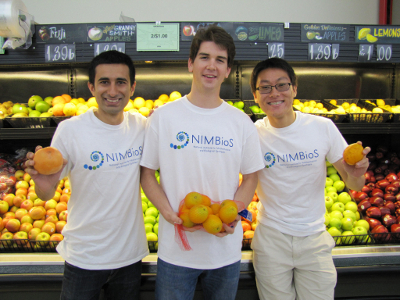 Congratulations to Ashish Gauli, Nathan Wikle and Ryan Yan — the three undergraduate students who developed mapping tool ComFlo as a part of their 2015 Summer Research Experience at NIMBioS. The team has been invited to attend the NatureServe EcoInformatics Workshop in Washington, DC, in December. An interactive website that can be used to visualize the domestic transport of most common commodities in the United States, ComFlo’s chief purpose is to help users track the potential spread of invasive species via shipping routes. Each of the students wins a $1,000 travel award as a part of the competition. ComFlo was as a product of the students’ research on the SRE project, “Ships, Ports, Invasions and Math: Invasive Species Movements through Global Shipping Routes,” with faculty mentors Louis Gross and Dan Simberloff. As the students began working on their summer project, they discovered there wasn’t a good tool to help visualize the network, so they set out to create it themselves. Wikle attends Truman State University and Yan attends the College of William and Mary. This entry was posted in awards, competitions, Education/Outreach, invasives, research, SRE, undergraduates and tagged awards, Education, invasives, SRE, undergraduates. Bookmark the permalink.